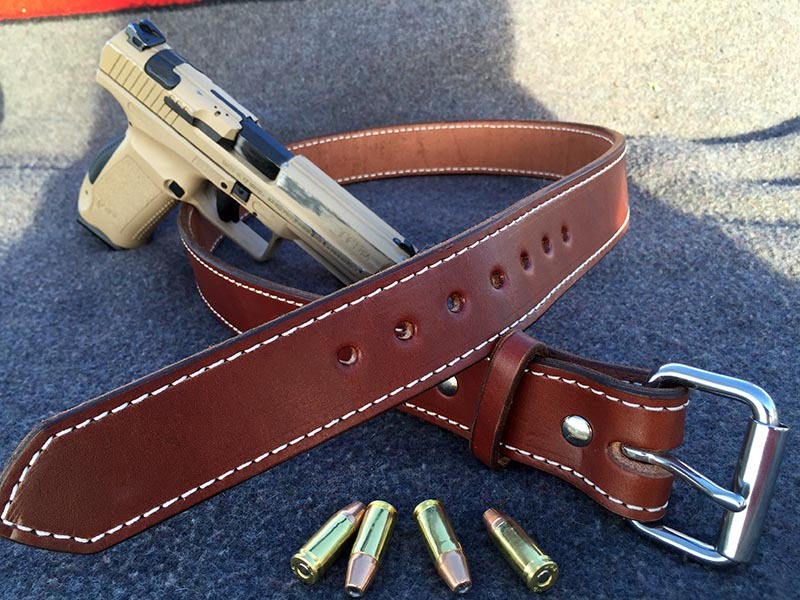 The author’s Exos Gun Belt, in saddle tan. This belt can handle full-size OWB gear or help keep your IWB gun discreetly concealed. For most inside-waistband carry methods, a good belt is a necessity. Lightweight belts made more for style than function can seem like a good option as many are made with low-profile buckles that don’t bulge or print under an untucked shirt. However, a fashion belt soon contorts and stretches out of shape when worn regularly with sufficient tightness to secure a holster. Fortunately, I’ve found two carry-specific belts that have held both my gun and my pants securely, and are stylish enough to wear exposed. Nexbelt, of California, started as a golf belt company. When its owners took an interest in concealed carry, we all benefited from the company’s approach to professional, low-profile appearance borrowed from that sport. The Nexbelt has no holes, but a strip of teeth on the interior of the plain end. The plain end slides easily through the metal buckle, which has a hook that tracks across the teeth with a ratcheting sound. When the belt is the desired tightness, simply stop. 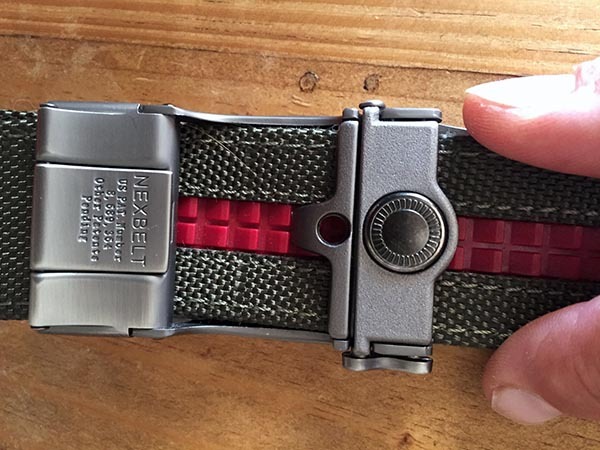 A small but easy-to-use lever on the downward-facing side of the buckle releases the belt. The fit is entirely custom; Nexbelts come in one size and can be cut to fit. Tightness is adjustable by approximately quarter-inch increments. This belt comes in a width of 1-7/16 inches. Every Nexbelt fits up to a 50-inch waist, or a 67-inch waist for the XL size, and is ready for cutting to the length of your choosing. My own copy of the Nexbelt is the company’s first-generation nylon model. I’ve been wearing it regularly for a couple years. The end that was cut by me to fit into the buckle has finally frayed enough to be a little rough-looking from the inside, and it’s time to clip a segment off to start anew. I purposely cut it generously when it was new for this reason. Nexbelt reps tell me the clamp that holds the cut end permanently has been improved for grip in the current generation of Nexbelts. My own has never threatened to come loose. This belt is available in nylon or leather, with several color choices in the tactical palette. Prices begin at $49.99, with a 20 percent discount offered to new customers. Nexbelt is a veteran-supporting company. 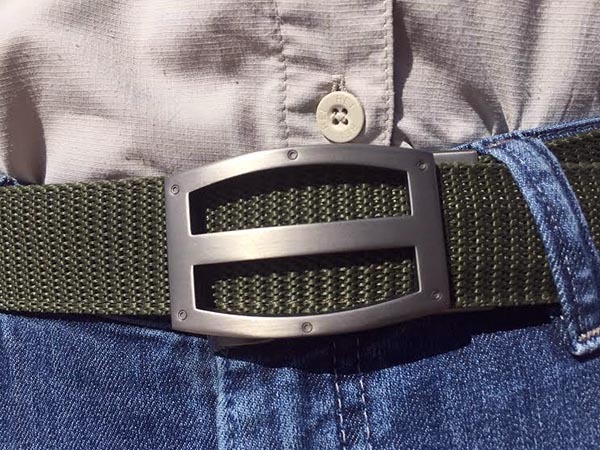 The Nexbelt buckle is low-profile and works great under an untucked shirt. This belt is thicker and stiffer than the Nexbelt, made entirely of thick, American, bridle-quality leather. Its stainless steel buckle has a roller for easy, quick tightening and prevents marring of the leather. After more than a year of wear, the buckle hasn’t dented the belt over the hole I always use. The Exos Gear Gun Belt is 1.5 inches wide and comes in several lengths to fit waists measuring 28 to 46 inches. Seven holes are spaced just ¾ inches apart to customize the fit around an inside-waistband holster. Two profiles are available in this belt; it comes in plain leather or with contrasting white stitching. It’s a matter of personal preference; I think the stitched version is more attention-drawing. Unlike the Nexbelt, the Exos Gear belt buckle more easily “prints” under fabrics. However, its 0.205-inch thickness makes it the superior of the two for transitioning from everyday wear to range wear. This belt easily supports a full-size pistol in on outside-waistband holster, mag pouch, and other gear if desired for formal range practice or duty wear. It is thus my choice for the many days when I’m moving between the range and in-town appointments where concealed carry is preferable, as I can easily transition between range and concealment rigs with a single belt. The Exos Gear Gun belt comes stitched or un-stitched in black, brown, chocolate, and saddle tan. Prices start at $39.84. Check out their Amazon listing to find a great gun belt at an affordable price. In conclusion, a good belt is an important component of most waistband carry methods. The two models represented here have served me well in daily carry. Between the advantages they offer for different aspects of my work and daily life, I feel no need to shop for another belt. I have 3 nexbelts. I love them. The first one I bought the buckle was black. I have had it over a year and the finish has come off of it. After 25 years of law enforcement I sure when I retired I wouldn’t wear a belt. Not so after finding this belt. I wear it every day. I also use one as my pistol competition belt.